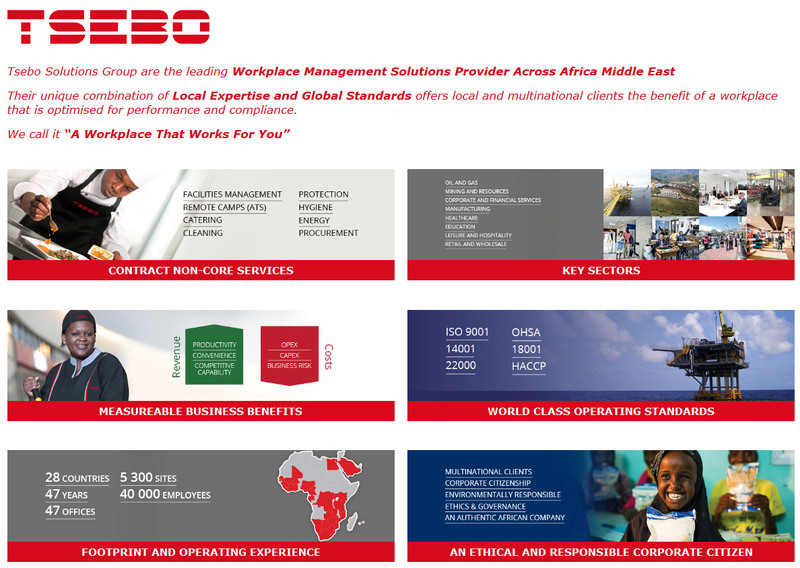 This site is provided by Tsebo Solutions Group on an as is basis. Tsebo Solutions Group makes no representations or warranties of any kind, express or implied, as to the operation of the site or the information, content, or products included herein. To the full extent permissible by applicable law, Tsebo Solutions Group disclaims all warranties, express or implied, including, but not limited to, implied warranties of merchantability and fitness for a particular purpose. Tsebo Solutions Group will not be liable for any damages of any kind arising from the use of this site, including, but not limited to direct, indirect, incidental, punitive, and/or consequential damages. This site is created and maintained by Timesaquare Advertising (Pty) Ltd in Gauteng, South Africa, under the control of Tsebo Solutions Group. The laws of the Republic of South Africa apply. We reserve the right to make changes to our site and these disclaimers, terms, and conditions at any time.